I'm wearing the costume. 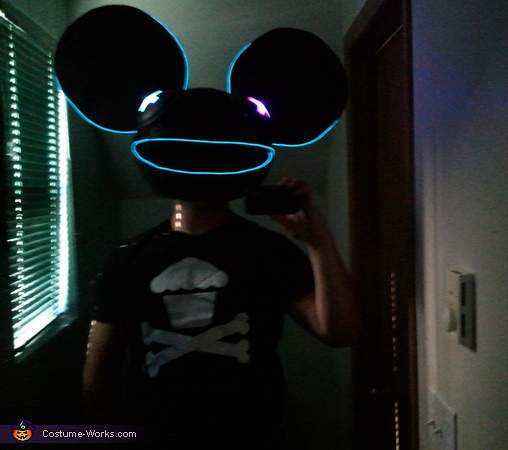 I got the idea at a live Deadmau5 concert. To make it, i got a hamster ball and cut a hole for my head, the mouth,eyes and 4 little one for the ears. I then put black velvet all over the head. To make the mouth, i layered metal mesh and black see through fabric. For the eyes, i just got two click on lights and changed out the bulb with a L.E.D one. I then put sound activated L.E.D lights lining the ears and mouth. On the inside, i used the inside of a safety helmet and foam to support and cushion my head. Everything is hot glued. Its really sturdy and lightweight and boy do people love it. Hey there, I love the costume and my 13 year old son and me are going to try to replicate it!! Can you please tell me how you made the ears and where you got the lights that you put on the ears and mouth?